It’s not all wine all the time in France. Paris brewed, we approve! 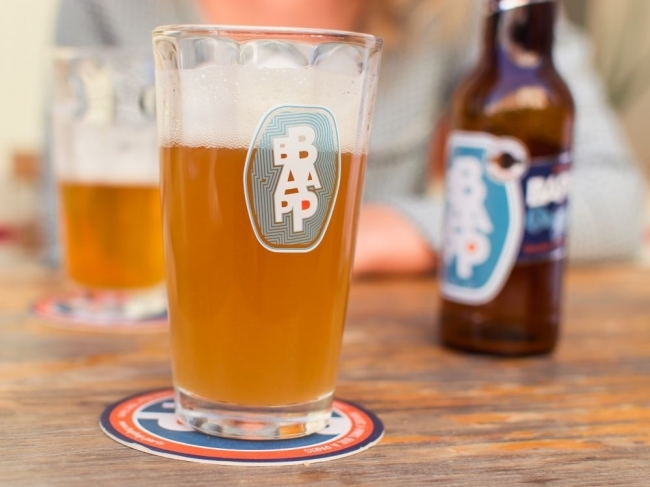 Craft beers are on the rise all over the world, and Paris is no exception, but finding them is more difficult than it should be. When every bar in the city seems to be called a brasserie (that’s brewery in French), even google can get mixed up. I’ve been living in Paris for years, and as a beer lover have been on the hunt for the tastiest local beers I could find. I’ve finally managed to narrow it down to four noteworthy breweries, read on for my can’t miss list! 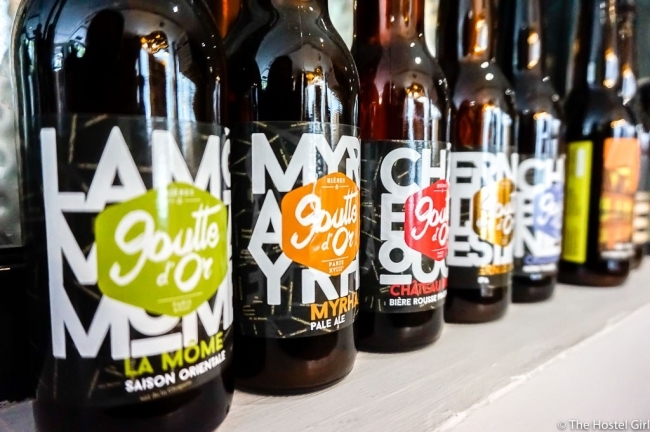 La Goutte d’or, originally opened in 2012, has a wide variety of beers ranging from traditional IPA to a chai wheat beer. Nearby is the famous Sacre Coeur where you can see one of the best views in Paris. What sounds better than stopping by for a sampling in their contemporary tap room, grabbing a couple cold ones for the road, and watching the sun set over Paris! This brewery is fairly new in the beer world, (opening just three years ago) but their progress in this short time is remarkable. They have recently collaborated with the head brewer of the famous Brooklyn Brewery to create a one of a kind saison, La Flamberge. La Flamberge was a part of their éphémère beers, meaning that they don’t stick around for too long. Click here to see their most recent options! This charming brewery is located in the 11th arrondissement, where I personally spent the first year of my life in Paris (living in a shoe box…hey, gotta love those Paris sized apartments!) therefore spending most days discovering this animated area. The famous Pere Lachaise cemetery is within walking distance, so it’s a perfect stop after your Pere Lachaise cemetery tour. The boutique hours are limited so I highly recommend signing up for a brewery tour. This brewery is really outstanding not only for its beers but its location as well. 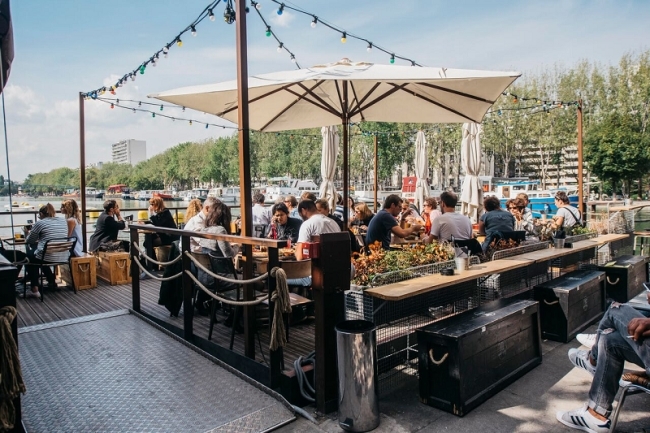 Overlooking the Bassin de la Villette, you can relax with a fresh pint on their terrace or floating pontoon! Not just a brewery, they are also known for their unique restaurant where they marinate their meats in their crafted beer. What more could you ask for in a brewery! Started in 1993, this brewery is an American’s home away from home with an English twist. You can find a Frog brewery at almost any point in your Paris tour as they have breweries located in the 2nd, 12th, 13th, and 16th arrondissements! I personally brewed here and can attest for their creativity and originality of each beer. With a full English speaking staff and a new beer series every year, you are sure to get exactly what you are looking for! Schedule a tour of the brewery. Opening hours vary by location. As a special merci for reading this article, we’re offering 5 euros off your next tour 🙂 Simply use the discount code BEER – happy booking! This entry was posted in Food & drink, Paris Activities, Restaurants & Cafes and tagged bar, beer, brewery, drink, Paris, pub. Bookmark the permalink.